A Royal Navy airborne surveillance Sea King helicopter has worked together with a Type 45 destroyer for the first time. A Sea King Mk7 Airborne Surveillance and Control helicopter approaches HMS Diamond’s stern in the Gulf. The ‘Bagger’ Sea King from 854 Naval Air Squadron worked with HMS Diamond while deployed in the Gulf in support of Combined Maritimes Forces (CMF). Sea King Mk7 Airborne surveillance helicopter nicknamed ‘Bagger’ approaches HMS Diamond Type 45 Destroyer for the first deck landing between these two Royal Navy units. 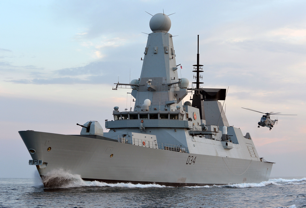 They are two of the Royal Navy’s most recognisable assets, but although Type 45 destroyers have been around for a good four years and the Baggers have been flying since the mid-80s in various forms, never the twain have met, until now. This unique event took place not off Cornwall, home to the Baggers – officially Sea King Mk7 Airborne Surveillance and Control (SKASaC) helicopters- or Portsmouth, home to five of the six Type 45s in Royal Navy service, but 3,500 miles (5,600km) away on deployment in the Gulf. SKASaC helicopters are commonly known as Baggers because of the distinctive sacks or bags that house their radar equipment. They are the Fleet’s ‘eyes in the sky’, used in a reconnaissance role to detect potential threats. The Baggers have built up a wealth of experience over land in Iraq and Afghanistan, and at sea, supporting Operation ELLAMY off Libya, over the past decade, playing key roles in ground and aerial operations respectively. The Culdrose based helicopters are committed currently over Helmand province and aboard the COUGAR task group, exercising in the Adriatic. Using the techniques honed from these deployments, the helicopters are bolstering surveillance at sea by demonstrating their ability to detect even small contacts at range and report them to friendly units. 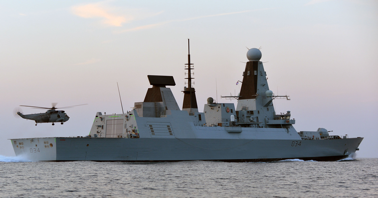 HMS Diamond is on her maiden deployment to the Gulf region, following in the footsteps of HMS Daring which deployed there earlier this year. She’s worked with the US Navy and its carrier battle groups, plus some of the UK’s allies in the Middle East, as well as carrying out maritime security operations in support of CMF Task Force 150 which is currently under the command of Commodore Bob Tarrant. “The complementary capabilities of Type 45 and Sea King Mk7 mean that we can assess air and surface activity over a wide area of the ocean,” said HMS Diamond’s Commanding Officer, Commander Ian Clarke.